The image below depicts 56301’s engine running, about to couple up to a rake of 24 MMA wagons behind it. Our loco then drew these down to the exchange siding where 66136 coupled onto the rear of the rake, ready to form the 1156 departure to Peterborough West Yard (eventually bound for Brandon). 56301 was then run back onto the other rake visible in the picture and shut down ready for another week’s work at Peak Forest. 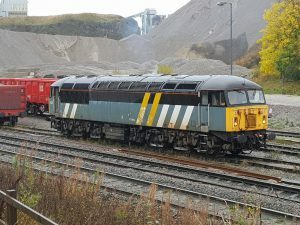 56301 at Peak Forest on Sunday 14th October 2018.